Plants yellow-brown, globose, convoluted, slippery, a few to ca. 8 cm in diameter; firm becoming hollow. Thallus largely of a medulla of large cells forming a branched network. Outer medullary cells ca. 80-130 µm long. Thin cortex of assimilatory filaments 3-4 µm in diameter and a few cells long, with enlarged terminal cell up to ca. 10 µm in diameter. Plurilocular sporangia branching laterally from cell at base of assimilatory filament, generally in groups of 3-5, uniseriate, ca. 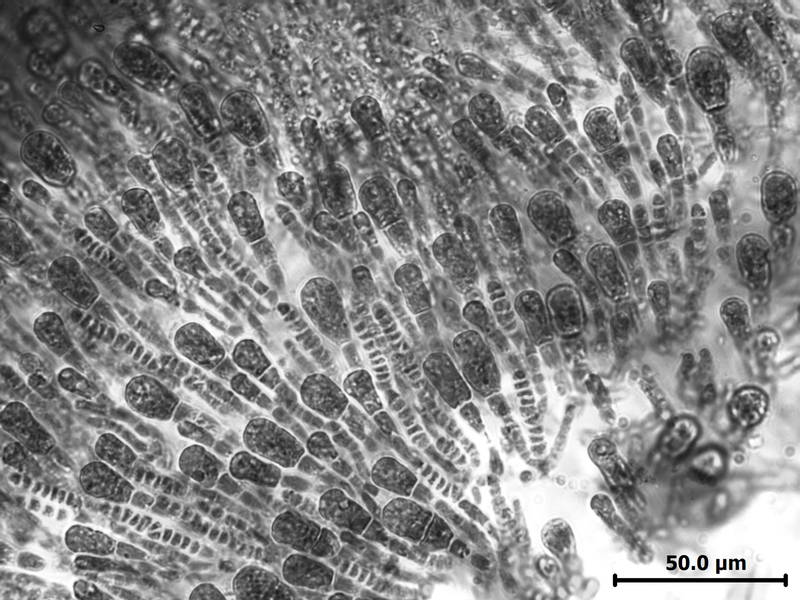 3-5 µm in diameter and 30-35 µm long, with 10-12 locules. Unilocular sporangia unknown in South African material. Recorded along the west coast, south coast and into Kwazulu-Natal as far as Mission Rocks. Epilithic or epiphytic in the eulittoral zone (1-56). World distribution: Widely distributed in temperate seas, including coast of Namibia (M.D. Guiry in Guiry & Guiry 2014). Type locality: (“in Confervis maris occidentalis” (Silva et al. 1996). Note: Superficially very similar to Colpomenia sinuosa, but the latter is much less firm and has a cortex that is obviously parenchymatous. Previously known as Leathesia difformis, but renamed for reasons of nomenclatural priority (MD Guiry in Guiry & Guiry 2014). 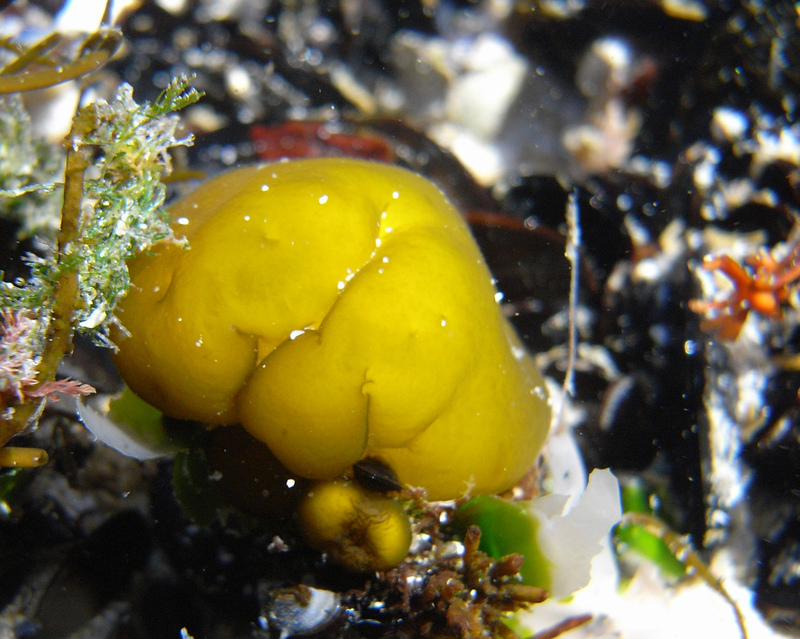 Leathesia marina in rock pool. Leathesia marina, xs showing filamentous cortex underlain by medulla. 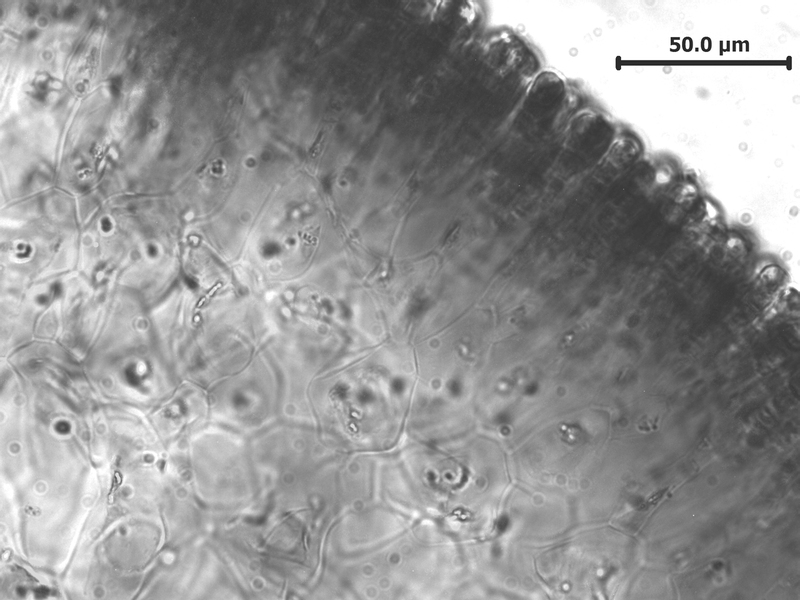 Leathesia marina, squash preparation of cortical filaments. Leathesia marina. 1. Habit, on Chordariopsis capensis. 2. 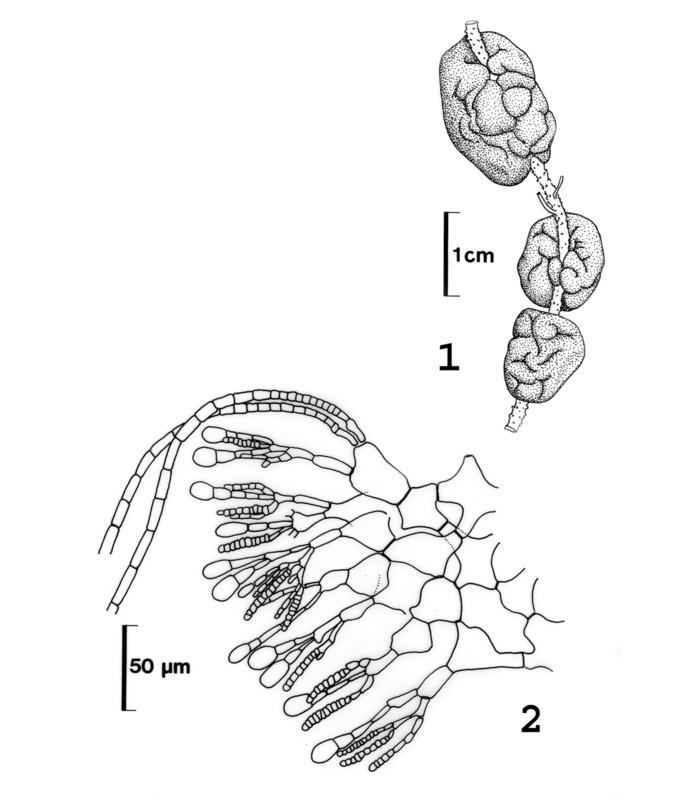 Section, with plurilocular sporangia (reproduced from Stegenga et al. 1997). Decaisne, J. (1842). Essais sur une classification des algues et des polypiers calcifères de Lamouroux. Annales des Sciences Naturelles, Botanique, Seconde série 17: 297-380, pls 14-17. M.D. Guiry in Guiry, M.D. & Guiry, G.M. 2014. AlgaeBase. World-wide electronic publication, National University of Ireland, Galway. 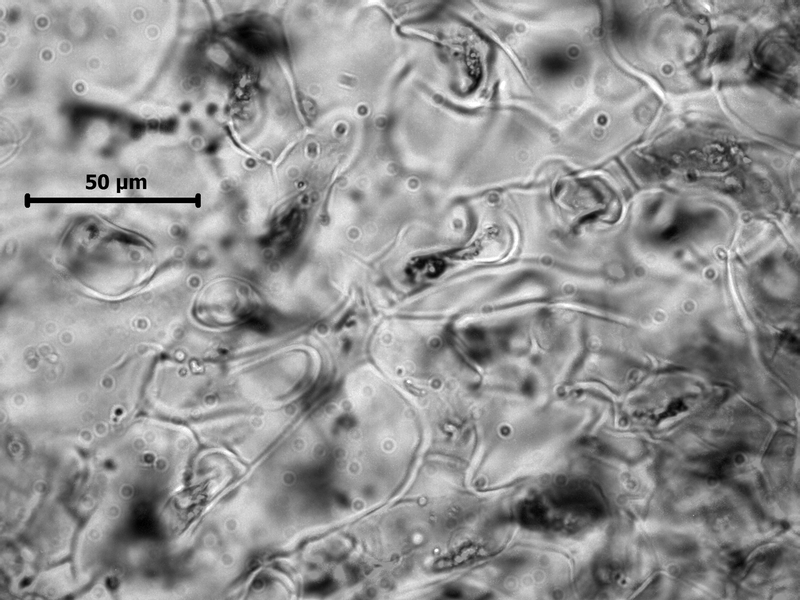 http://www.algaebase.org; searched on 09 September 2014.